This hyaluronic acid gel is smooth filler that is eased under the skin to instantly smooth out wrinkles or folds that look like parenthesis along the sides of the mouth and nose. Juvederm can also be used to enhance the lips and soften lip lines. Juvederm generally lasts for up to six months or longer. This safe and natural cosmetic dermal filler that restores volume and fullness to the skin to correct moderate to severe facial wrinkles and folds, such as the lines from your nose to the corners of your mouth. Restylane is made from synthetic hyaluronic acid and the effects generally last for about six months. Juvederm Voluma XC is an injectable gel that instantly adds volume to your cheek area to correct age-related volume loss in adults over the age of 21. Part of the Restylane family, this Hyalaronic acid dermal filler with lidocaine is FDA approved to treat both the cheeks, to provide a natural looking lift, and correct lines and folds on the sides of the nose and mouth. Because of its larger particle size Restylane Lyft adds more volume with using less product that lasts approximately 1 year. 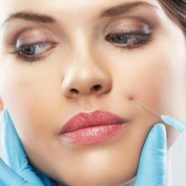 This is dermal filler that conveniently fills and corrects smile lines and can enhance cheek bone area. Radiesse works with your body, below the skins surface. Tiny calcium-based microspheres gradually break down and are naturally and safely absorbed by the body while stimulating your own body’s natural collagen. With little or no downtime results are immediate and typically last up to a year. Sculptra is a synthetic injectable material known as poly-L-lactic acid, a safe biodegradable material that absorbable suture material is made from. It is injected below the surface of the skin in the area of volume loss. Sculptra provides a gradual increase in skin thickness. Visible results appear within the first few treatment sessions. Sometimes Sculptra is referred to as “the liquid face lift.” Treatment results may last for up to a year or more after the treatment sessions are completed. Touch-up sessions may be needed to maintain the desired effect. Bellafill is a non-resorbable aesthetic injectable used to correct facial wrinkles. This injectable consists of a mixture of Bellafill Precision-Filtered Microspheres, Bellafill Purified Bovine Collagen and lidocaine for pain relief. With the microspheres not being absorbed by the body, Bellafill provides a permanent support structure. Results are seen immediately and proven to last up to three years. A skin test is necessary prior to injections to check for sensitivity. Restylane Silk is a filler that can help you achieve your ideal smile. It is the first FDA-approved product specifically designed for lip enhancement and the smoothing of wrinkles around the mouth.